New electromechanical system whichreduces working times and increases centring precision. A high-resolution videocamera and artificial vision techniques allow identification of the balancing planes displayed on the touch screen. At the same time the laser sensors automatically measure and provide the operator with the balancing positions calculated and proposed. By the system with maximum precision in just a few seconds during the measurement cycle. At the end of the spin the wheel is braked and automatically brought to the balancing position. The integrated led light illuminates the work area to facilitate rim cleaning and application of the counterweights. The internal point laser indicates,with maximum precision, the position of application of adhesive counterweights. 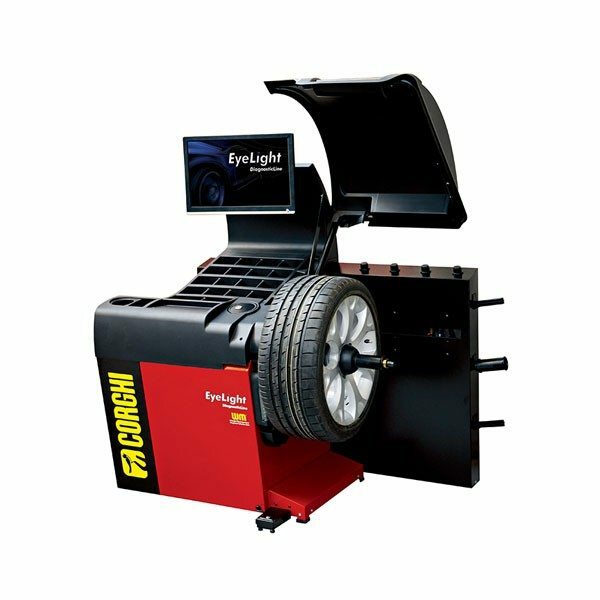 Special diagnostic tool for the vehicle wheel set monitoring:- Tread wear – drift angles – run-out – unbalance Once all the wheels have been stored, eyelight proposes their optimal placement on the vehicle for maximum comfort and safety. The graphical interface and touchscreen technology simplify and speed up operations and work program selection. benefits and safeguarding the environmental. Multifunction (one-touch) button. Speeds up selection of the various work programs. Ergonomic and functional, with large trays for the different types of counterweights and tool positioning. Space-saving wheel casing with automatic opening at end of spin. Designed to allow positioning of the wheel balancer against the wall and to accommodate wheels with diameter of up to 44” (1118 mm). Inclined front part to improve operator access to the rim. Rear splash guard with slots for additional accessories.